Noel Cressie, an expert in spatial and spatiotemporal statistics, describes his work analyzing climate models and assisting a team at the Jet Propulsion Laboratory (JPL) in understanding the data coming in from NASA’s Orbiting Carbon Observatory-2 (OCO-2) satellite. 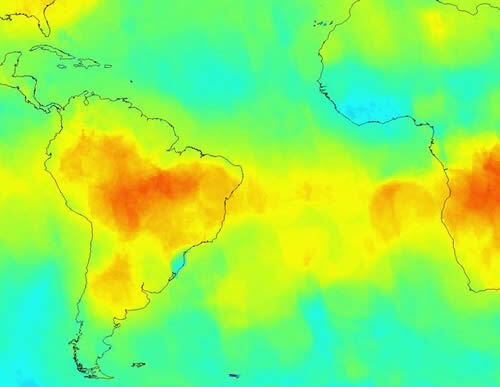 A sensitive instrument on OCO-2 is measuring carbon dioxide in the earth's atmosphere. Read the interview with Cressie. 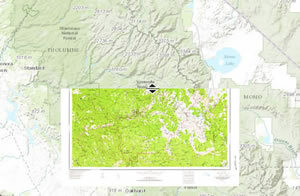 Use the Swipe Layer tool to see underlying layers in a map created using ArcMap. Read the tip. News from the Esri User Conference includes upcoming support in ArcGIS for working with drone imagery and new capabilities to analyze very big data. Read the article. 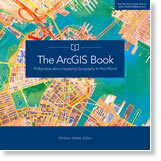 The ArcGIS Book presents 10 ideas on how to apply geography to your work using web GIS. The book—available on the web, as a PDF, and in print—also includes 10 lessons to build your web mapping skills. Read the article. Get the book. Esri is working on a new free app called ArcGIS Earth, which will let you view either 2D or 3D maps over the Internet or behind a firewall. Read the blog. Be notified when the app is released. Esri president Jack Dangermond explains how the ArcGIS platform is evolving, including in 3D and real-time GIS, imagery, big data, and spatial analysis. Read the article. The Andean Alliance for Sustainable Development, working with volunteers, is using GPS, Collector for ArcGIS, and ArcGIS Online to map trails for tourists visiting the Andes Mountains in Peru. Read the article. Develop a sustainable community by using GIS to collect, analyze, visualize, and share information. There are many new tools available—3D GIS, geodesign, and more. Read the article. The dog days of summer have arrived in many parts of the world, and the beach is calling. Take a good GIS book with you, along with your sunscreen, hat, and towel. Here are six recommendations. Read the article. With Esri Maps for Office, you can make interactive, dynamic maps that add geographic content to your PowerPoint presentations. Read the article. Learn to create a real-time operational view to monitor emergencies using Operations Dashboard for ArcGIS. Take the Learn ArcGIS lesson. Esri has just added new capabilities to ArcGIS Online, including enhancements to smart mapping, scene viewer, and analysis tools. Read the blog. Esri's Suzanne Boden offers some ArcMap, ArcGIS Pro, and ArcGIS Online shortcuts and tips. Read the blog. Esri president Jack Dangermond believes that GIS and geoanalytics will play a major role in applications for the Internet of Things (IoT). Read the article. Need a little inspiration for your next map creation? Then check out the Esri Cool Maps gallery for ideas. Read the article. 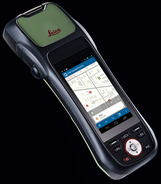 Esri and Leica offer the new ZenoCollector, a high-accuracy solution for ArcGIS using ArcGIS Online and Collector for ArcGIS. Order today. This story map takes you into the Danakil Depression in Ethiopia, Africa, where volcanic activity and blistering temperatures make this one of the hottest places on earth. View the story map.